Sir Christopher Frayling read history at Churchill College, Cambridge where he later gained a PhD in the study of Jean-Jacques Rousseau. Joining London’s Royal College of Art in 1979, Frayling founded the Department of Cultural History, and from 1996 to 2009 was Rector and Vice-provost of the college. Frayling’s achievements and honors are numerous. He is Chancellor of the Arts University Bournemouth (AUB), and has been awarded honorary doctorates by nine universities in the UK. 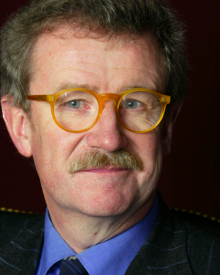 In 2001, he was awarded a knighthood for “Services to Art and Design Education”. Other prominent roles have included Chairman of the Design Council, Chairman of the Royal Mint Advisory Committee, Trustee of the Victoria and Albert Museum, Patron of the Robin and Lucienne Day Foundation, and between 2004 and 2007 Chairman of the Arts Council England. Outside of design circles, Christopher Frayling is known for his wide output as a writer and critic on subjects ranging from the semiotics of advertising through to vampires. He has written and presented a number of series for television and radio including The Face of Tutankhamun, The Art of Persuasion, and Nightmare: Birth of Horror. Frayling’s love of film, particularly the spaghetti western’s of director Sergio Leone, led him to become governor of the British Film Institute in the 1980s, as well as help run the Los Angeles-based Gene Autry Museum's exhibit on Leone in the summer of 2005, and appear in numerous documentaries about Leone and his films. When Frayling received his knighthood he chose as his motto “Perge scelus mihi diem perficias”. Translating as “Proceed, varlet, and let the day be rendered perfect for my benefit”, he wanted to evoke the well- known words attributed to the protagonist Callahan in Dirty Harry: “Go ahead, punk, make my day”.